I have always been an animal lover, especially with dogs and horses. I have an 8 year old Shih Tzu named Riley who helped me by adding responsibility to my life and giving me even more love for all dogs. I have work experience in a cage free grooming environment as a dog bather so I have plenty of experience working with dogs of all sizes and temperaments. I'm also happy to give your dog a great professional quality bath. I have been pet sitting for about 8 years now! If you have any questions or would like any references please contact me! Please contact me so we can discuss your pets normal daily schedule. I want to know all the details so I can give your pet a sense of stability in their routine while you are away. 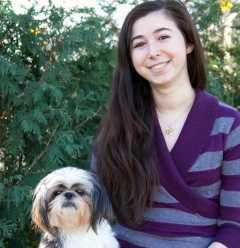 I am a young pet care professional looking to care for your dog or cat! Your pet will have my full attention to make their time away from you less stressful. I love getting to know the different personalities of each animal and getting to bond with them and create lasting relationships. Kayla's service is located in or nearby Farmington Hills, Michigan. Book via PetBacker for Insurance, Payment protection & 24x7 support.